We rise and shine around 7:00am to start a full day of cool stuff. 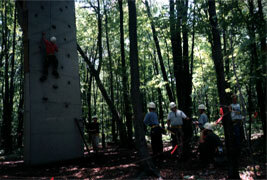 Half of the group goes shotgun shooting while the other climbs. At lunch the groups switch. 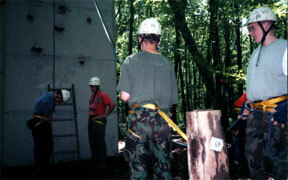 Kevin, who helped me run the climbing wall, and Wayne, the shotgun instructor, are shown here discussing the weather. Everyone learns how to tie a "Swiss seat" from a single piece of 30' tubular webbing. It is more comfortable than it looks. Safety is key on the wall! 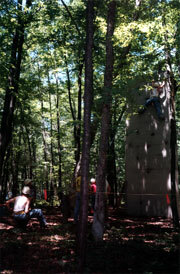 Here is a climber attempting the first and easiest wall on the tower. 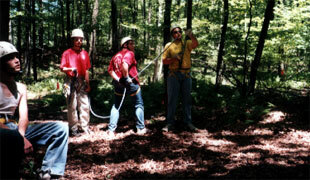 Notice the belay man, but belay man, ladder guy, and slack man. 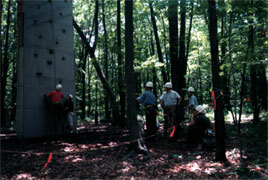 Everyone pitches in to make the climbing environment a safe one! Here's someone on the second wall. Only about half of everyone can make this wall. Here's someone on the third wall. 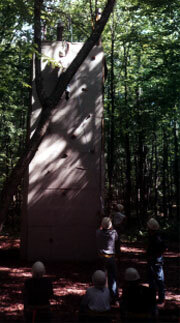 This one is the most difficult because the holds are very small, hard to grasp, and far apart. 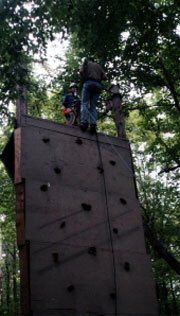 There is also an overhang at the top that is difficult to get over. Only about a dozen people have finished this wall since it has been open. Thirteen years and hundreds of attempts. 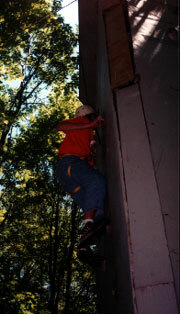 Here I am demonstrating how to rappel of a wall. 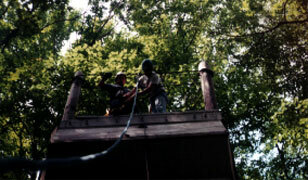 Here I am clipping in our first rappeler of the day. About 3:00 on the second day everyone canoes back to their camp. We have the task of towing the canoes back to Discovery in "Rusty," our trusty utility boat. That's Wayne Ickes at the controls.